I could talk about being a youth and young adult during the sixties and seventies and the myriad events I witnessed, the upheavals that altered this society’s institutions of many kinds. Or the ways family was redefined and individuals found community in new ways. There were pioneering and also risky ideological movements; women’s rights made progress and many men came to know themselves differently, as well. The assassination of JFK alone would have ben enough to rock our young worlds. It was a time of change that made an impact we would feel decades later. I could tell you my little story. But this attempt at saying something that matters is about theirs, almost all of which I barely know. This essay is not “for” or “against” anything, but simply in remembrance of those who have gone before us due to being soldiers. They have had expectations and thoughts regarding events about which I have understood less than I should. But I can at least say that back then there was Viet Nam first and last in our lives. It permeated the news, our consciousness, our fears, questioning. Television left less and less to the imagination and the images followed us into sleep. Front pages held news daily that stopped us in our ordinary lives. We had our own ways with the war: enlisted or were drafted, debated, protested, marched, prayed for peace, tried to ignore it, worried, waited it out a very, very long while. So when I see this picture my breath leaves me and it sears on the way out, aches upon its return. 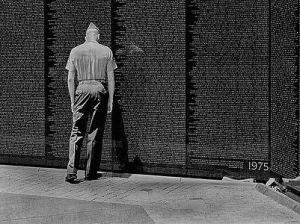 I stood at that memorial, that wall, many years later, touched the names chiseled in the smooth, obdurate surface. I watched the soldiers and families, felt my face burn and eyes fill, heart contract. But I have never been a soldier. Standing there was so private, yet so public as all who were present shared grief and memories together at the wall. But not all who left passed on. My brother came back from the Viet Nam War a changed spirit, a different kind of man altogether, and for me a brother I feared lost. I was confused. I could not touch him so far away was he from us. His easy laughter had long left and the rooms were emptier for it. I was not a child but it sorrowed me in a way that nothing and no one could explain away. I did not find the brother from before but he did return to us in body, and slowly, he redesigned his life. He lived each day as he best determined it. He unfroze over time but the thoughts were kept to himself; pain, no doubt bitter, never named. Yet somewhere his changed destiny allowed him to unearth indelible beauty and love, which he offered again. Or it found him, like an angel settling in. One way he may have been renewed was through photography, a way of seeing and translating life even when he was a soldier. I have seen his pictures of the women and children, men in doorways, streets full of the still-living, the country and city landscapes so haunting to me. Perhaps they helped him salvage the good that survived. I don’t know. He stepped forward and continued on. I’ve rediscovered him again since becoming an adult. I’ve become less innocent but more attentive, too. I study his photographs past and current and think they hold a kind of vivid austerity, a lean and elegant power that comes from burning. A quietude. Something sacred and also forlorn co-mingles in light and shadows. He has travelled around the world many times and brings back stories for my eye and spirit. I can wander with him. For all that, I am more than thankful. And he shares kindnesses in more ways than can be noted here. Yet as he himself would likely note: too many gone. I once walked through the Arlington National Cemetery. The endless white, simple crosses with stringent light streaming through trees…that unavoidable silence, yet a silence potent and heavy. It hollowed out a place in me from which a tidal wave of weeping issued as I walked on and on. I feel it again today. There is so much more to the story we see in the photo above. Tales that survivors hold secret. Things some release in increments that nonetheless feel vast. And it still haunts and covers us with a cloak of pain. Prayers like songs that never end: they fall like drops of blood to earth yet also take flight. To the Universe. To God, who waits for us to remember our compassion, seeks to heal without our ever knowing all the answers. Or the right questions, I sometimes think. So many separate lives, sacred to the whole of this, our humanity. 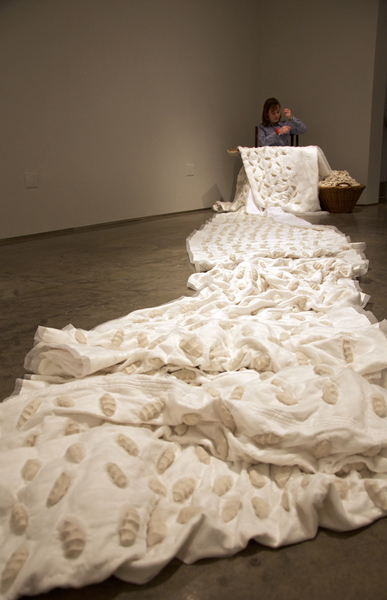 That is what I think of when I see my artist daughter’s mammoth handmade quilt, the fabrics into which she sewed and counted porcelain “bones” to represent each soldier who died in Iraq. “In memoriam” was the engine of her industry and moved her heart. Her lap was heavy with yards of fabric sheltering clay pieces, then folded on the floor. She sat in a rocking chair exposing, stitching, recreating, remembering the losses. And the spirit of her work was unleashed. She has shown it in art galleries where few of us may fathom lives lost, to forces we poorly decipher. But the essence of those gone is evident. How many wars this world has counted and still counts. Soldiers who have taken their places. Our country alone: those going, too often not returning. So many lives. I bow my head. Tears do not, cannot speak enough- cannot touch enough- cannot change this world enough. But that doesn’t keep me from hoping and praying, still. It doesn’t put out the light. But we cannot forget who and what has been, and who still carries on. *Note: Vietnam Memorial photo is courtesy of Patricia Ann McNair’s blog.